This entry was posted in Uncategorized and tagged Atlas Shruuged, Ayn Rand, Big sister, Conservatives, economy, elitism, evil, Gore Vidal, juvenile, killers, libertarian, Margaret Thatcher, Millenials, money, morally depraved, Nietzsche, profit, propaganda, psychopathic, psychopathic personality, psychosis, radicals, Randian State, Reagan, Social Darwinism, society, tea party, Thatcher, wealthy, wicked, William F Buckly, William F. Buckley Jr., William Hickman. Bookmark the permalink. A thought-provoking essay, Hipmonkey. It has been decades since I read Atlas Shrugged, but your cogent and well-supported critique makes me curious to know why I saw the book so differently. At the time I read it I was in college — my organic chemistry teacher recommended it to me, telling me I reminded him of one of the tragic heroic characters. I identified with those who challenged power, and saw the elite as puppeteers who consciously promoted mediocrity as the rule. Those who challenged the mediocrity of the ruling elite paid the price. These profoundly different perspectives fascinate me! It makes me think of something I read in literary criticism that I struggled to understand initially — the reader is part of the text and ultimately gives the book meaning. Meaning depends on the lens of the reader. It leads me to ask if those on the margins see different messages in Rand and other works. I have certainly found this to be the case with other books I have read — my interpretations of the text proved to be something the authors didn’t understand and couldn’t have written. So I am honestly puzzled how I missed this! Could it be that through an Ojibwe or bi-cultural lens, the message I saw was quite opposite to what Rand meant to convey? That only those who resist mediocrity and hegemony are capable of humanity and community? How cool that you identified with the underdogs in the story! That’s actually very sane and rational. 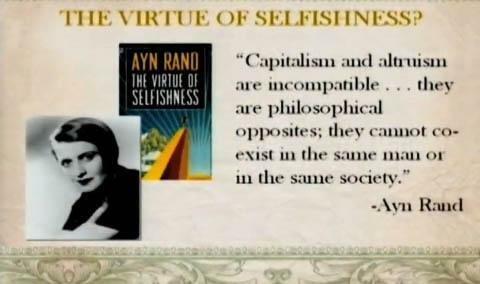 It must be shocking to realize that Ayn Rand and her supporters actually identified with, and rooted for the elites. I don’t suppose you’re up for a re-reading? It’s in movie form on Netflix right now. It’s actually embarrassing that I can be so naïve and clueless about other interpretations! I’m not up for a reread — but maybe Netflix!